KANSAS CITY, Mo. — When it comes to our kids, we will do anything for them. But, when they become sick, we feel absolutely helpless. So, Children's Mercy is trying to keep parents fully involved when it comes to their kids' procedures and surgeries with an app called EASE. For the Crusha family, this was their first time using the app as they were waiting for their daughter Sophia to get out of surgery. "She's our go-getter. She's our little firecracker, a spitfire. She's always one or two steps ahead of us," said Sophia's mom, Anna Crusha, when describing her daughter. "We learned she had Atrial Septal Defect, which is basically a small hole [in the heart], which is in the two upper chambers," said Crusha. On Wednesday, Sophia was having a cardiac catheterization. This is to help her in the long run and give her a normal life. When the Crusha's came in for their pre-check in, they found out about the EASE app. You could call it the medical version of Snapchat. "It's been called that by some. 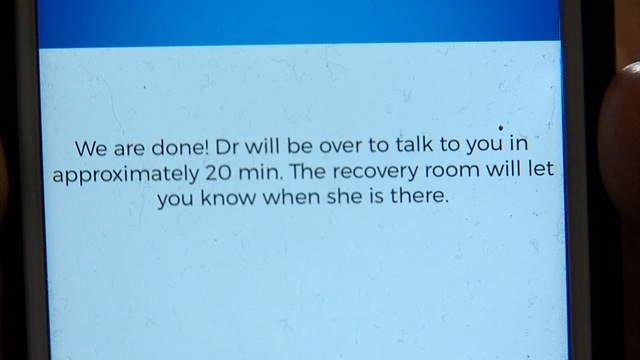 Essentially the provider in the room is able to send updates to the parents own phone and those updates disappear within approximately 60 seconds," said Stacey Gibson, a nurse practitioner in Children's Mercy Heart Center. They get texts like this. "'So, device is in place. Watching it to be sure it is exactly where doctor wants it. Her vital signs are good,'" said Crusha. The texts come from nurses in the room and are slowly rolling out sending pictures. "Occasionally once their child has fallen asleep and they are safely off to sleep, we find that that's a time that the parents can find just great reassurance that their child is calm and asleep," said Gibson. But, the app doesn't just alert parents. "I think the other thing with us there's lots of family that are praying and wanting to get updated at the same time. So, we were able to send invitations to them. So, it's like we are all here in the waiting room," said Crusha. They are making sure parents feel they are right in the surgery room. "We have learned it's an additional way enhancing that experience for the family while they are waiting during the procedure," said Gibson. At the end of the day, the Crusha family knew Sophia was in good hands because the family was getting updates. Sophia is doing well after her surgery. Right now, the hospital is just conducting a trial run, but they hope to have it in every part of the hospital soon.